Austrian Hebraist; born at Jezierzany, Galicia, April 25, 1835. His mother was a descendant of Ḥakam Ẓebi. 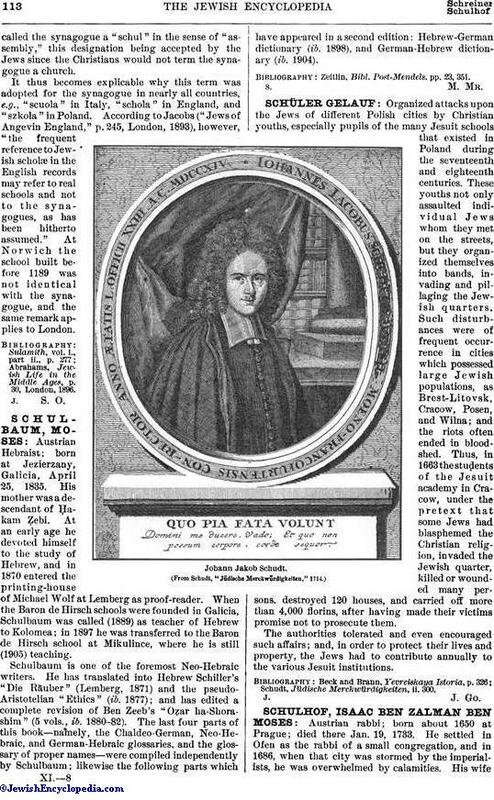 At an early age he devoted himself to the study of Hebrew, and in 1870 entered the printing-house of Michael Wolf at Lemberg as proof-reader. When the Baron de Hirsch schools were founded in Galicia, Schulbaum was called (1889) as teacher of Hebrew to Kolomea; in 1897 he was transferred to the Baron de Hirsch school at Mikulince, where he is still (1905) teaching. Schulbaum is one of the foremost Neo-Hebraic writers. He has translated into Hebrew Schiller's "Die Räuber" (Lemberg, 1871) and the pseudo-Aristotelian "Ethics" (ib. 1877); and has edited a complete revision of Ben Zeeb's "Oẓar ha-Shorashim" (5 vols., ib. 1880-82). The last four parts of this book—namely, the Chaldeo-German, Neo-Hebraic, and German-Hebraic glossaries, and the glossary of proper names—were compiled independently by Schulbaum; likewise the following parts which have appeared in a second edition: Hebrew-German dictionary (ib. 1898), and German-Hebrew dictionary (ib. 1904). Zeiltlin, Bibl. Post-Mendels. pp. 23, 351.